Whip it, Mix it, Beat it! Power Cord Length: 2.6’ ft. The NutriChef Cordless Kitchen Mixer - 3-Speed Hand Mixer with Built-in Rechargeable Battery - Whip it, Mix it, Beat it! 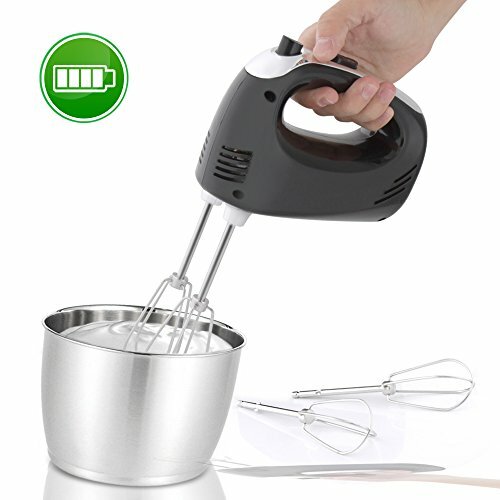 - High-Powered Hand Mixer - Cordless & Compact Design - Built-In Rechargeable Battery - Power Cable & Adapter Charges via USB Port - Selectable 3-Speed Settings - Simple Button Controls - Dual Stainless Steel Food-Grade Whisks - Easy Clean-Up: Eject Button Whisk Release - What’s in the Box: - Cordless Hand Mixer - (2) Stainless Steel Whisks - USB Power Cable & Adapter - Technical Specs: - Power Output: 100 Watt MAX - Mixing Speed: Up to 650 RPM - Construction Material: Engineered ABS. Mixing Speed: Up to 650 RPM - Construction Material: Engineered ABS.